So, to cut to the chase, you look at both gameplay videos and the graphics are very comparible and not likely to be a deciding factor in this generation (IMO). The controllers both appear to be slight remakes of their prior generations controllers, but I'd give the most improved to the PS4. I think elongating their handgrips will do them well. The touchpad part, meh, touch devices and me don't normally get along (callouses from guitar playing). XBOX continues to improve upon their positioning as an entertainment center device while Sony continues to focus on games. 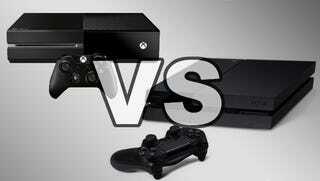 However, what XBOX is doing with Kinect, smartglass, and cloud services may just give it a creative edge. Like many creative ideas before, it may not work out all that well for them. MS gathered lots of bad press about their connect once every 24 hours thing (really? Thats a big deal? In our "always connected" age of technology?). But they got even worse press over the DRM of games (which I get both sides of the for and against argument here. Theres money to be made, and money to be saved). I wouldn't be surprised if MS redacts those restrictions and allows everything to continue the way it has for the past 30+ years of console gaming. PS4 skates by without any bad press in these areas (and it makes one wonder if they just changed all their similar plans to avoid the punishment MS is getting). PS4 eye is not included, while the Kinect is. PS4 eye will cost 60 US dollars. Compare that to the current Kinect which sells for about $100 dollars. So do some math here and realize that you're getting the Kinect free (presumably at least a $100 value [by current gen pricing] included... So that pretty much puts these consoles on a very comparible pricing scale). So, that all being said, this is what we were expecting for the next-gen systems. Its a boost in performance and graphics on both systems. Neither are backwords compatible (except that PS4 announced ability to stream prior generation games. Wouldn't be surprised if XBOX does the same). In My Opinion, XBOX gets the edge this round. Yes the DRM and always connected thing is a drag, but the tech that was demoed at E3 with smartglass and cloud computing seems to give it the extra edge in my mind. Now, I get game exclusivities, and if you're a fan of one franchise over the other, then get that system. I'm personally a Halo guy, a Gears of War guy, and a Forza guy... So naturally I will go with the XBOX One (not to mention Gold membership and XBOX music subscription that I already utilize, with my WP8, Surface RT, and Win8 laptop... I'm already geared to get the most out of the XBOX One).